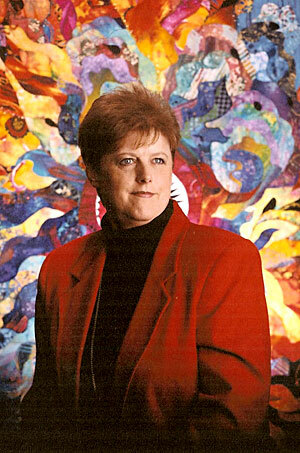 Quilt Artist Barbara Olson’s National and International Award-Winning Quilts have appeared in publications and exhibits around the world. “In The Beginning” one of Barbara’s art quilts was chosen as one of the 100 Best American Quilts of The Century. Many of her art quilts are included in corporate and private collections across the country. Barbara has developed workshops and lectures for those interested in expanding their unique creative talents in the area of quilt art for the last eighteen years. Her classes are not only fun and dynamic they are also filled with wonderful techniques that will excite the adventuresome creative spirit. Barbara is Author of “Journey of an Art Quilter Creative Strategies & Techniques” a cutting edge art quilt publication. Studio Art Quilt Association, International Quilt Association, American Quilters Society, Quilt Art Association - Charter Member, Quilt By Association - Past President, Big Sky Quilt Association - Chairman 1995 Retreat, Association of the Pacific Northwest Quilters.